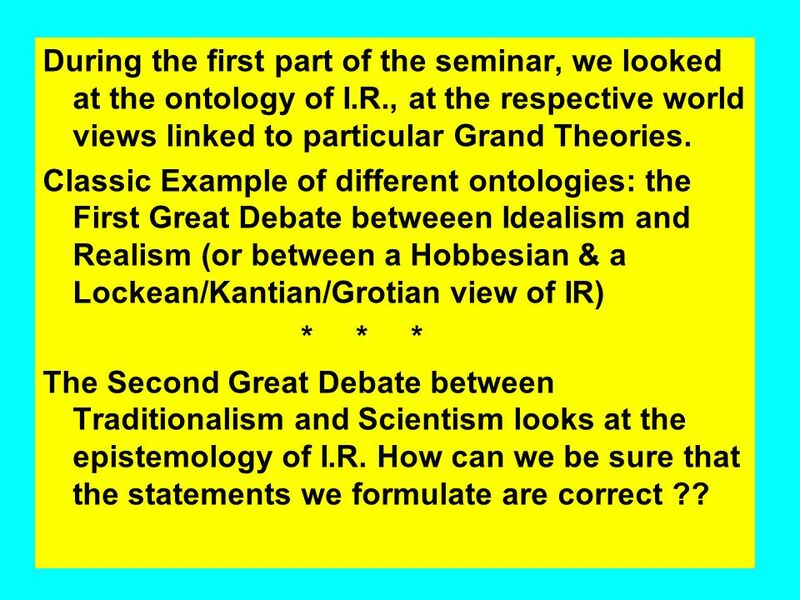 3 During the first part of the seminar, we looked at the ontology of I.R., at the respective world views linked to particular Grand Theories. 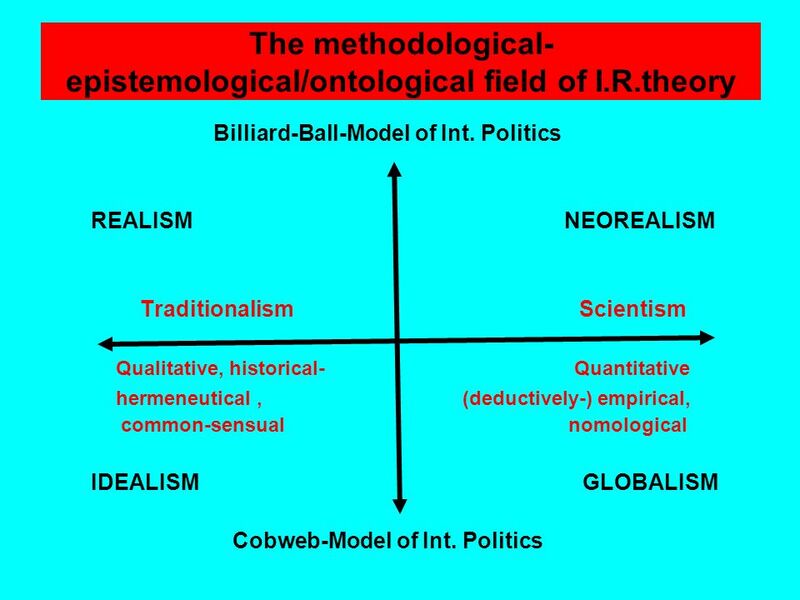 Classic Example of different ontologies: the First Great Debate betweeen Idealism and Realism (or between a Hobbesian & a Lockean/Kantian/Grotian view of IR) * * * The Second Great Debate between Traditionalism and Scientism looks at the epistemology of I.R. How can we be sure that the statements we formulate are correct ?? 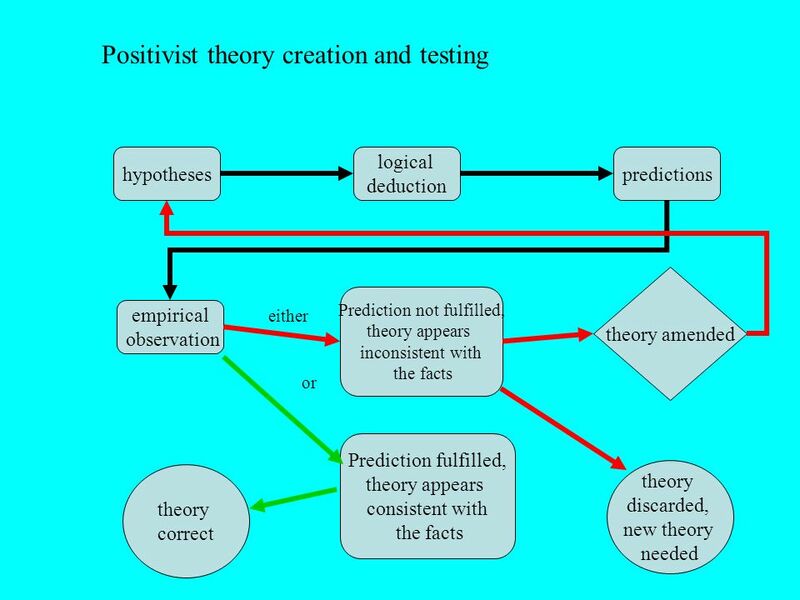 The Behavioralist or Scientistic Approach shows a concern with explanatory rather than normative theory recurring patterns rather than the single case operational concepts that have measurable empirical referents rather than reified concepts conceptual frameworks rather than all-encompassing world-explaining theories the techniques of precise data gathering, measurement and presentation. 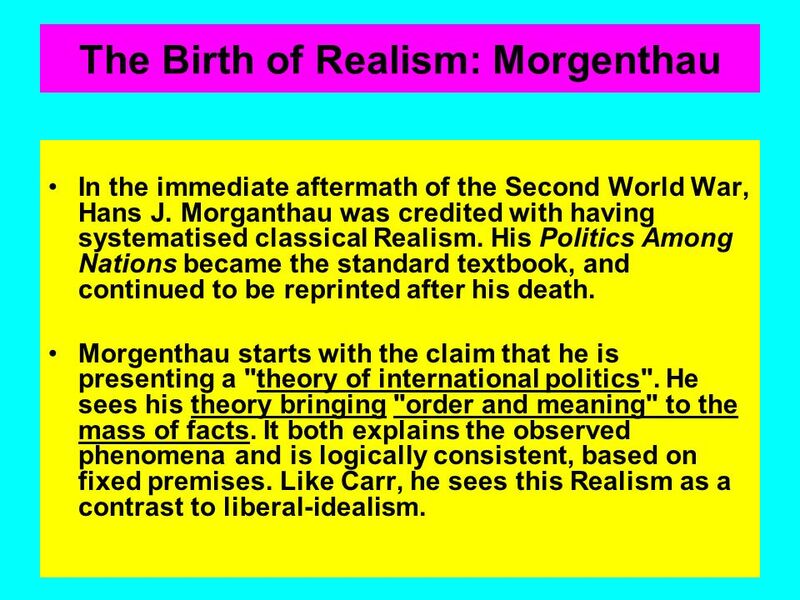 In the immediate aftermath of the Second World War, Hans J. Morganthau was credited with having systematised classical Realism. 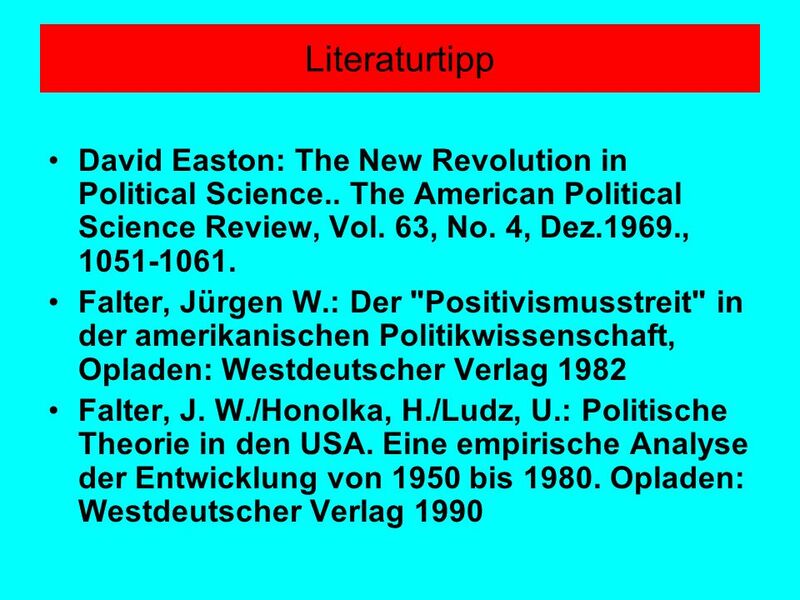 His Politics Among Nations became the standard textbook, and continued to be reprinted after his death. 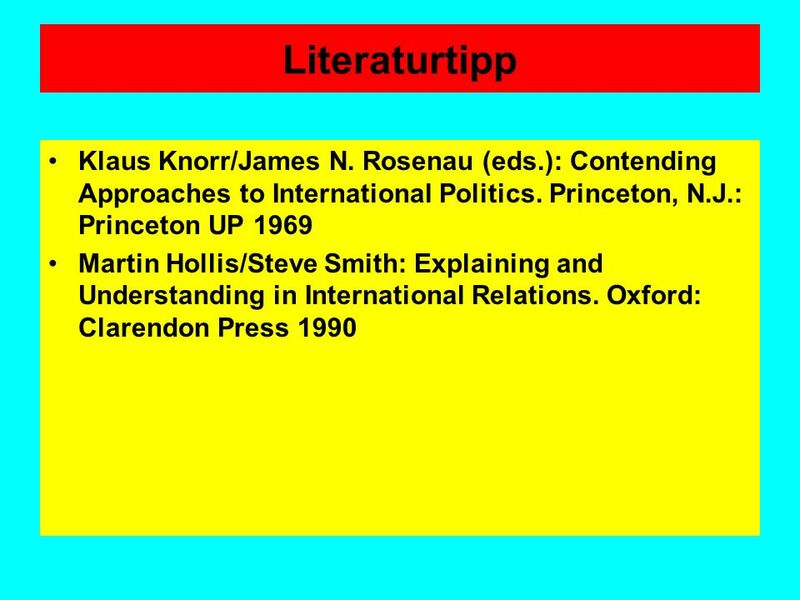 Morgenthau starts with the claim that he is presenting a "theory of international politics". He sees his theory bringing "order and meaning" to the mass of facts. It both explains the observed phenomena and is logically consistent, based on fixed premises. 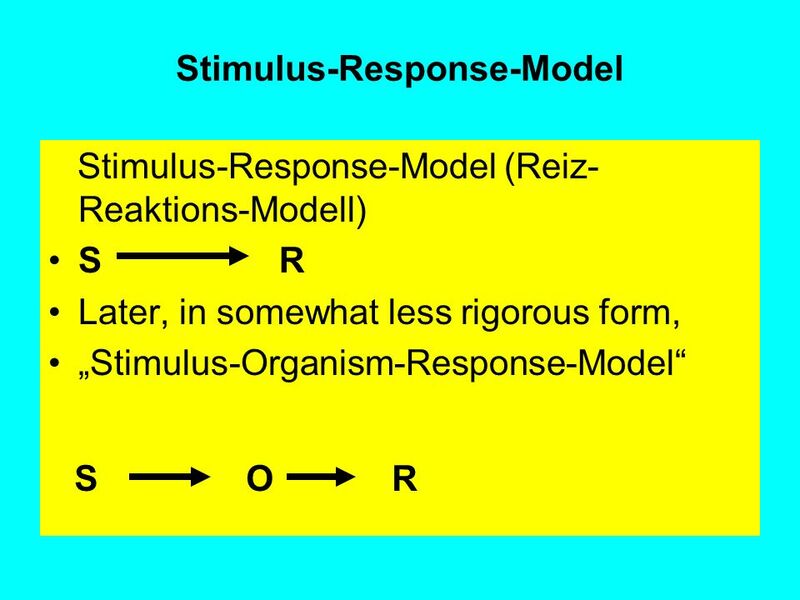 Like Carr, he sees this Realism as a contrast to liberal-idealism. 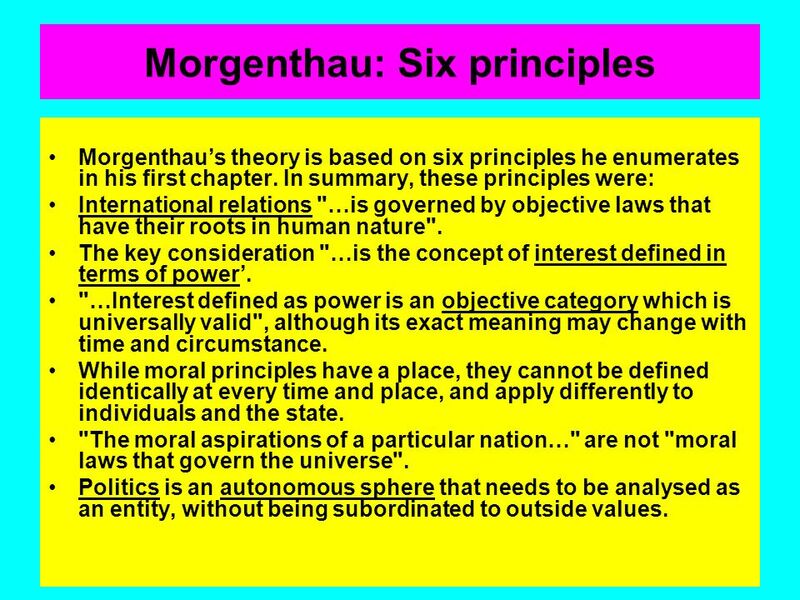 Morgenthau’s theory is based on six principles he enumerates in his first chapter. 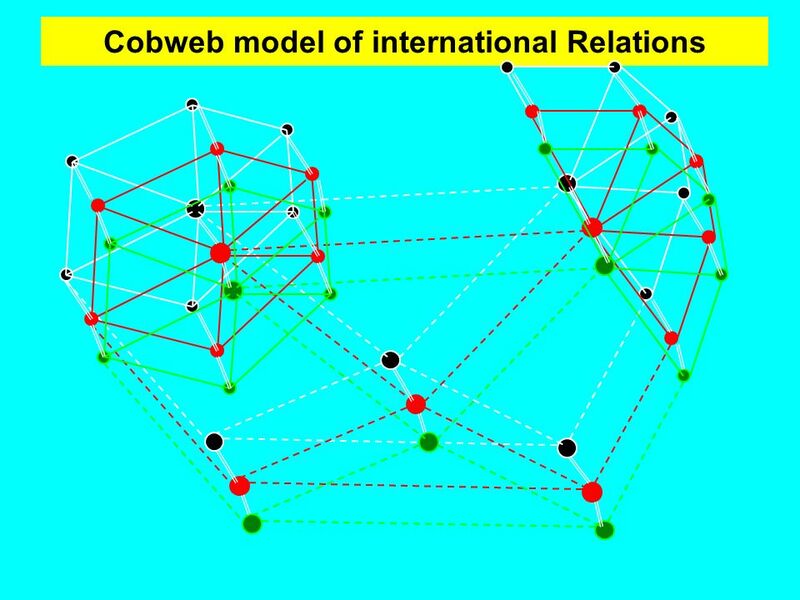 In summary, these principles were: International relations "…is governed by objective laws that have their roots in human nature". 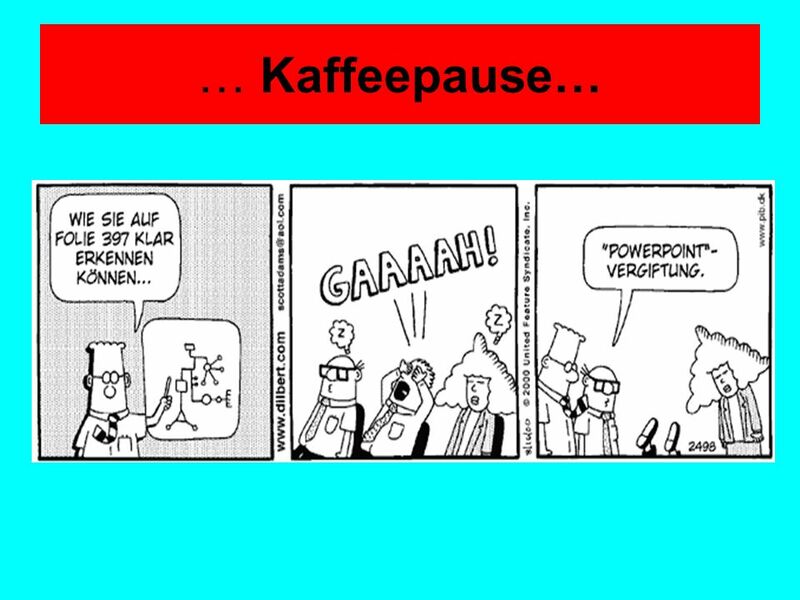 The key consideration "…is the concept of interest defined in terms of power’. 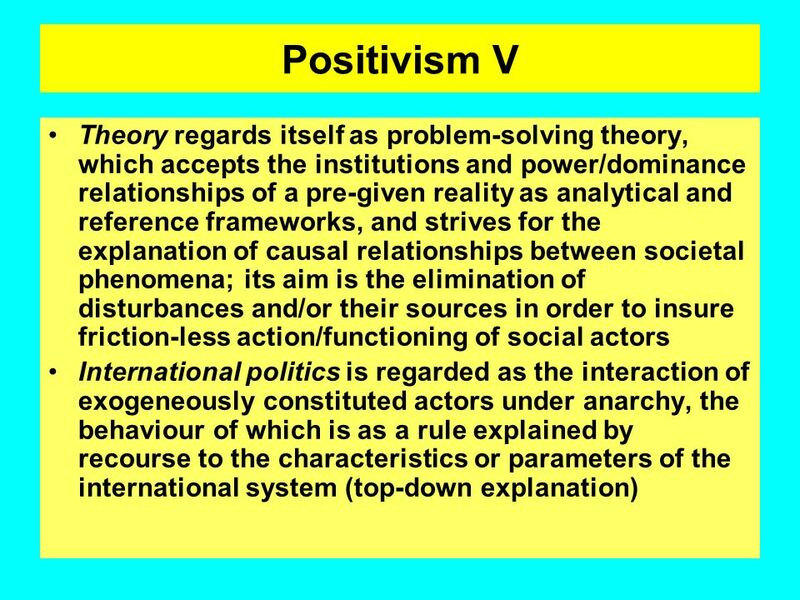 "…Interest defined as power is an objective category which is universally valid", although its exact meaning may change with time and circumstance. 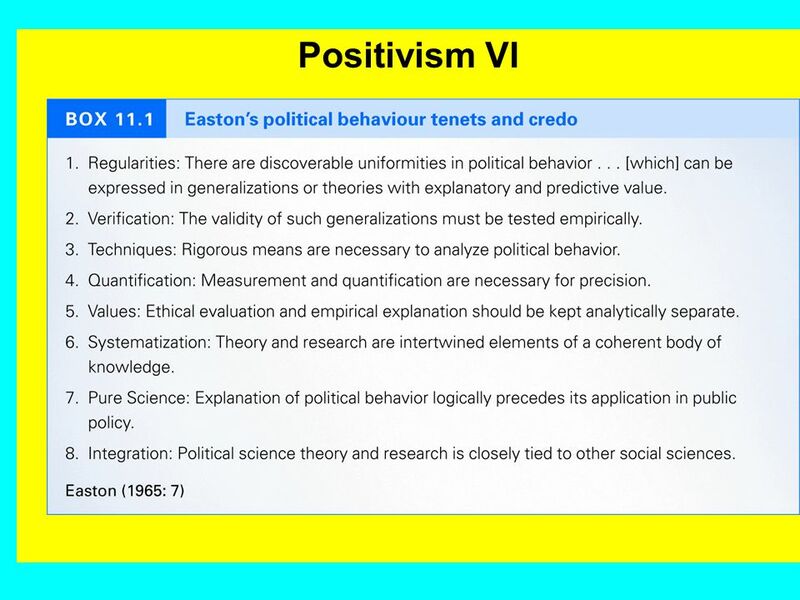 While moral principles have a place, they cannot be defined identically at every time and place, and apply differently to individuals and the state. "The moral aspirations of a particular nation…" are not "moral laws that govern the universe". 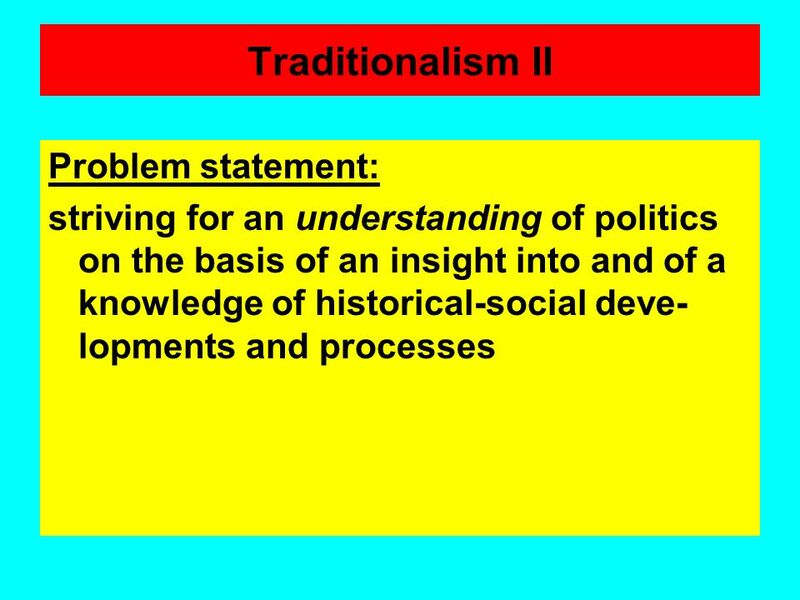 Politics is an autonomous sphere that needs to be analysed as an entity, without being subordinated to outside values. 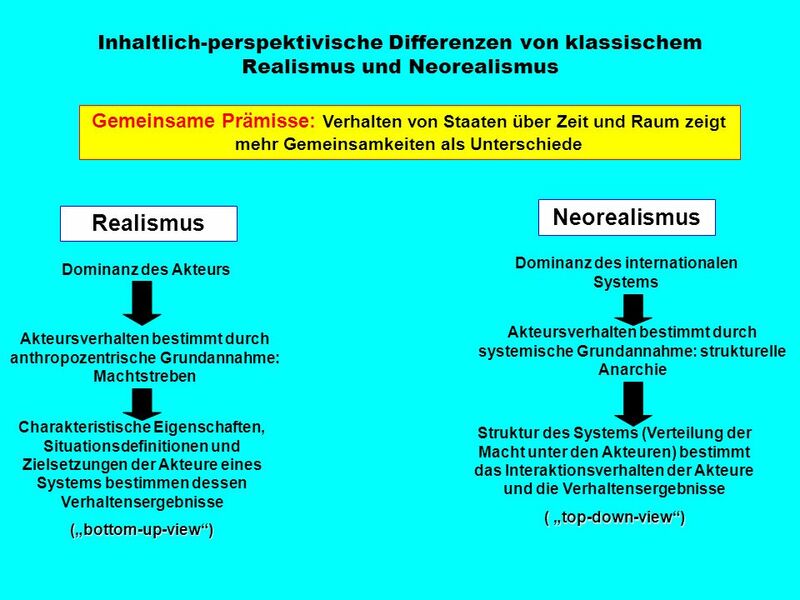 17 What is Realism II Of the threads that make up the Realist school, the most important ideas include: International relations are amenable of objective study. Events can be described in terms of laws, in much the way that a theory in the sciences might be described. These laws remain true at all places and times. The state is the most important actor. At times the state may be represented by the city-state, empire, kingdom or tribe. 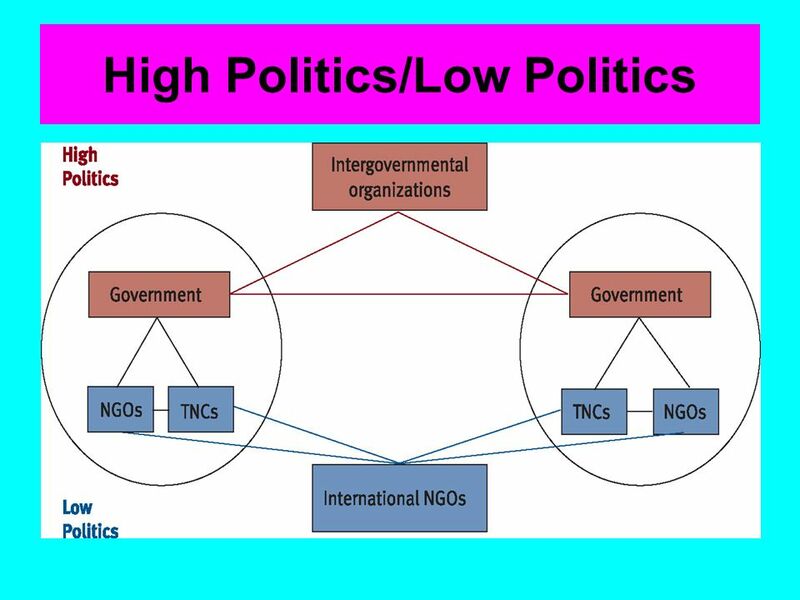 Implicit in this is that supra-national structures, sub-national ones and individuals are of lesser importance. Thus the United Nations, Shell, the Papacy, political parties, etc, are all relatively unimportant. 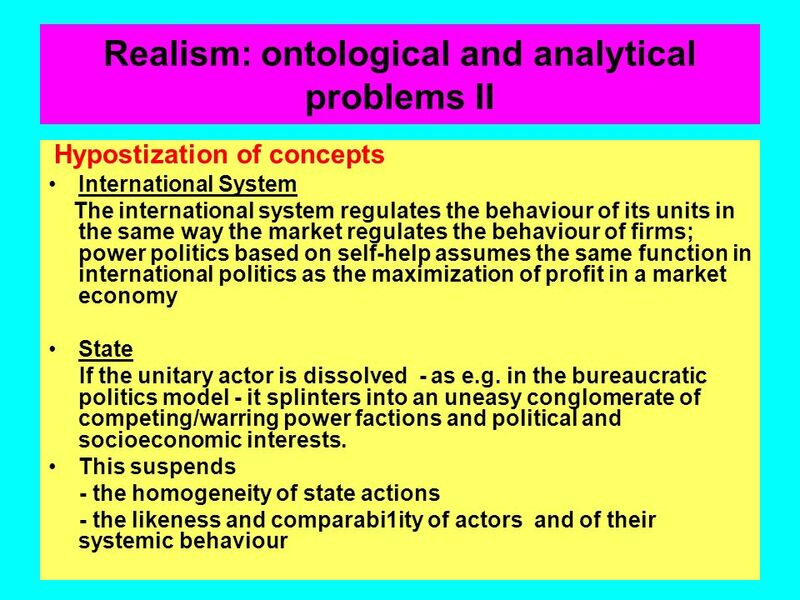 The first corollary is that the international system is one of anarchy, with no common sovereign. 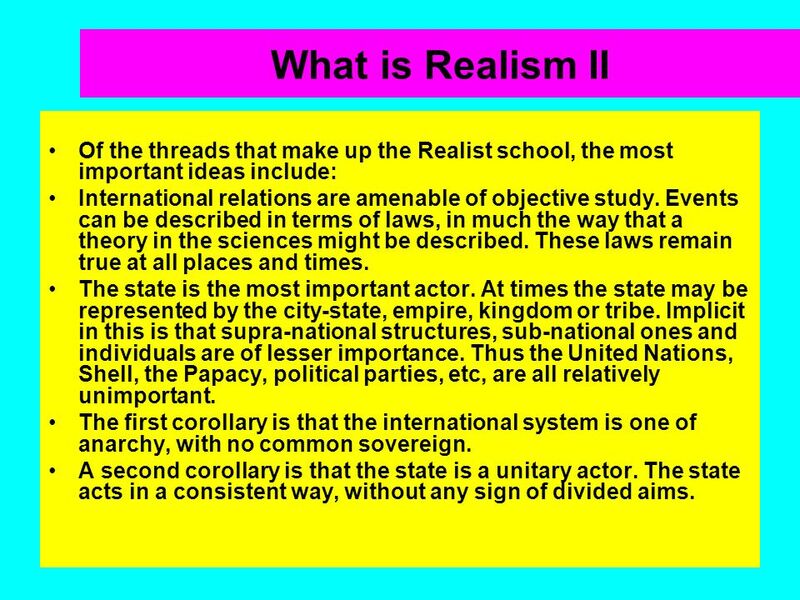 A second corollary is that the state is a unitary actor. The state acts in a consistent way, without any sign of divided aims. 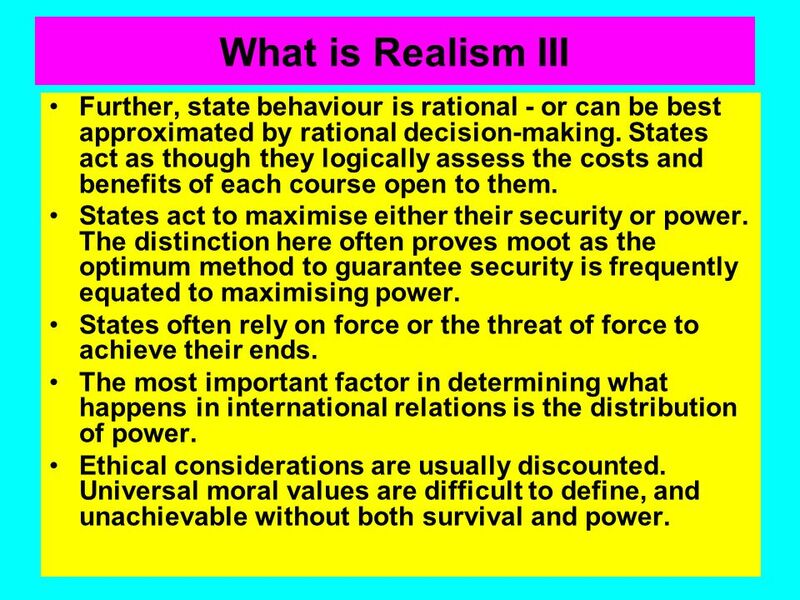 18 What is Realism III Further, state behaviour is rational - or can be best approximated by rational decision-making. States act as though they logically assess the costs and benefits of each course open to them. States act to maximise either their security or power. The distinction here often proves moot as the optimum method to guarantee security is frequently equated to maximising power. States often rely on force or the threat of force to achieve their ends. 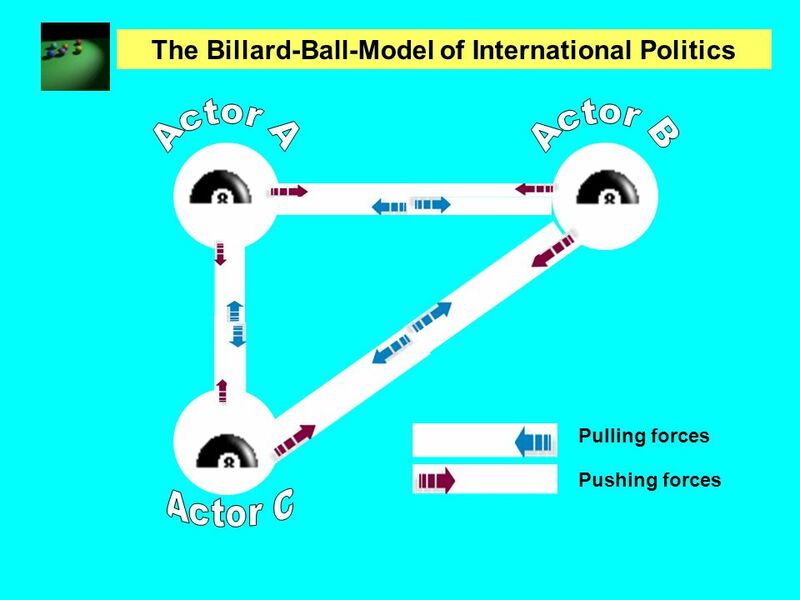 The most important factor in determining what happens in international relations is the distribution of power. Ethical considerations are usually discounted. Universal moral values are difficult to define, and unachievable without both survival and power. 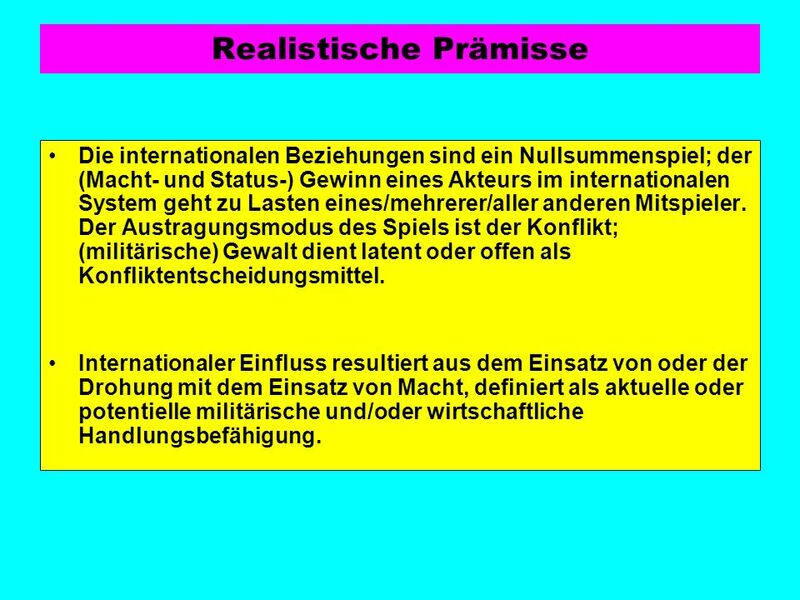 Die internationalen Beziehungen sind ein Nullsummenspiel; der (Macht- und Status-) Gewinn eines Akteurs im internationalen System geht zu Lasten eines/mehrerer/aller anderen Mitspieler. Der Austragungsmodus des Spiels ist der Konflikt; (militärische) Gewalt dient latent oder offen als Konfliktentscheidungsmittel. Internationaler Einfluss resultiert aus dem Einsatz von oder der Drohung mit dem Einsatz von Macht, definiert als aktuelle oder potentielle militärische und/oder wirtschaftliche Handlungsbefähigung. 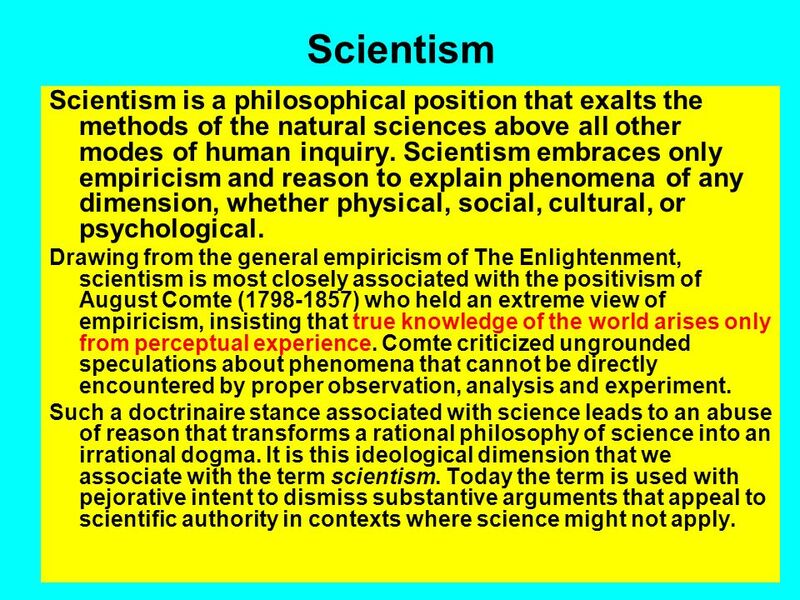 25 Scientism Scientism is a philosophical position that exalts the methods of the natural sciences above all other modes of human inquiry. 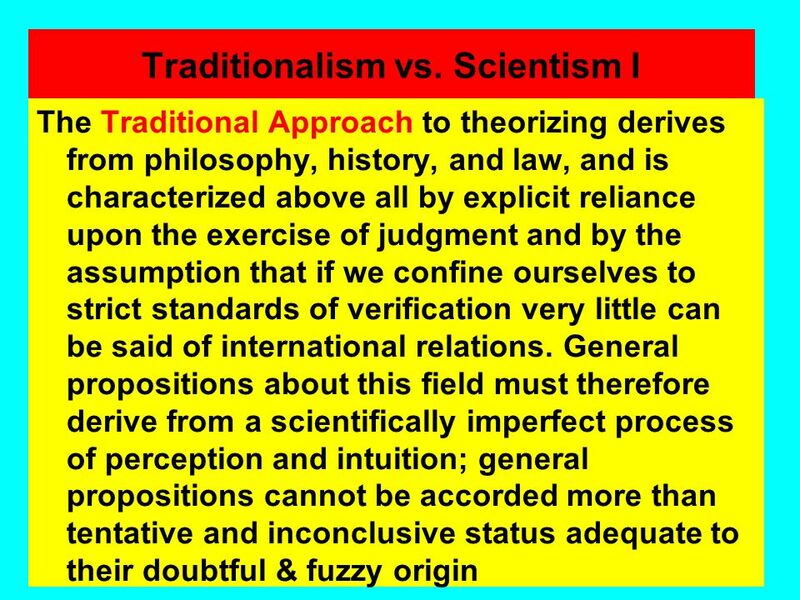 Scientism embraces only empiricism and reason to explain phenomena of any dimension, whether physical, social, cultural, or psychological. 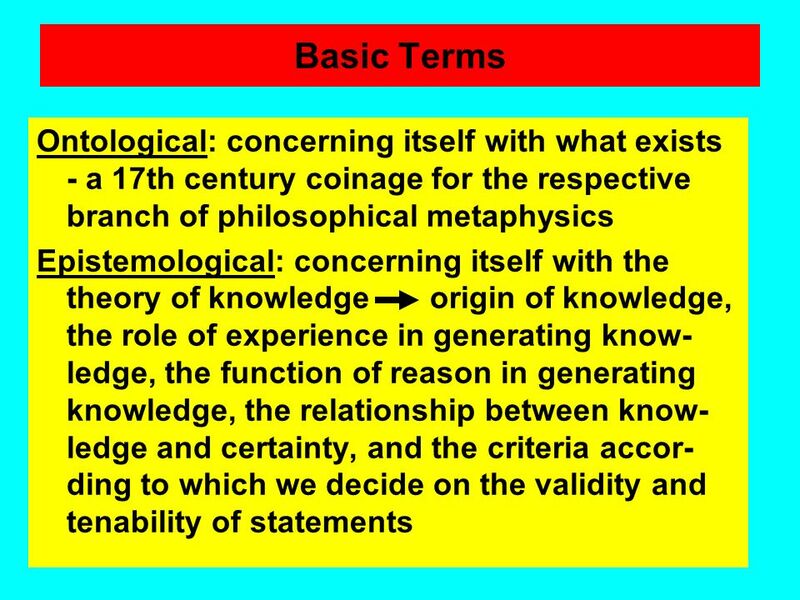 Drawing from the general empiricism of The Enlightenment, scientism is most closely associated with the positivism of August Comte ( ) who held an extreme view of empiricism, insisting that true knowledge of the world arises only from perceptual experience. Comte criticized ungrounded speculations about phenomena that cannot be directly encountered by proper observation, analysis and experiment. Such a doctrinaire stance associated with science leads to an abuse of reason that transforms a rational philosophy of science into an irrational dogma. 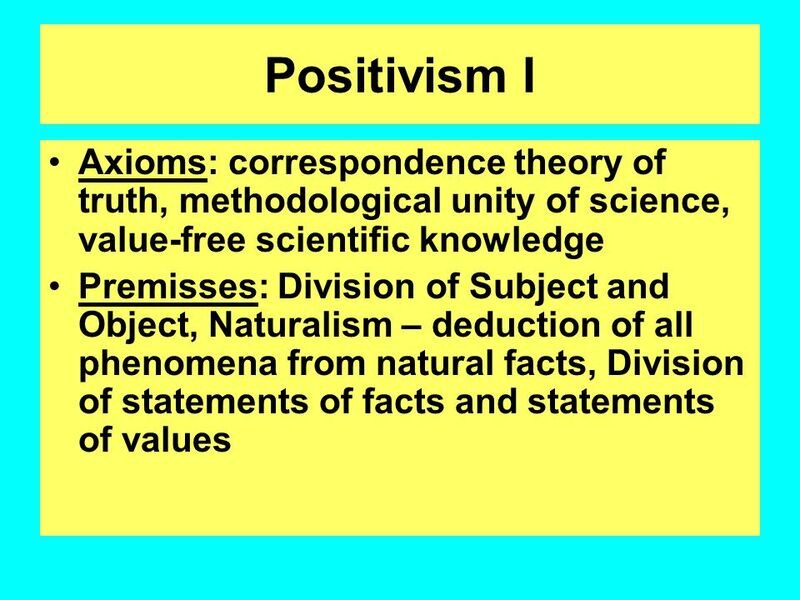 It is this ideological dimension that we associate with the term scientism. 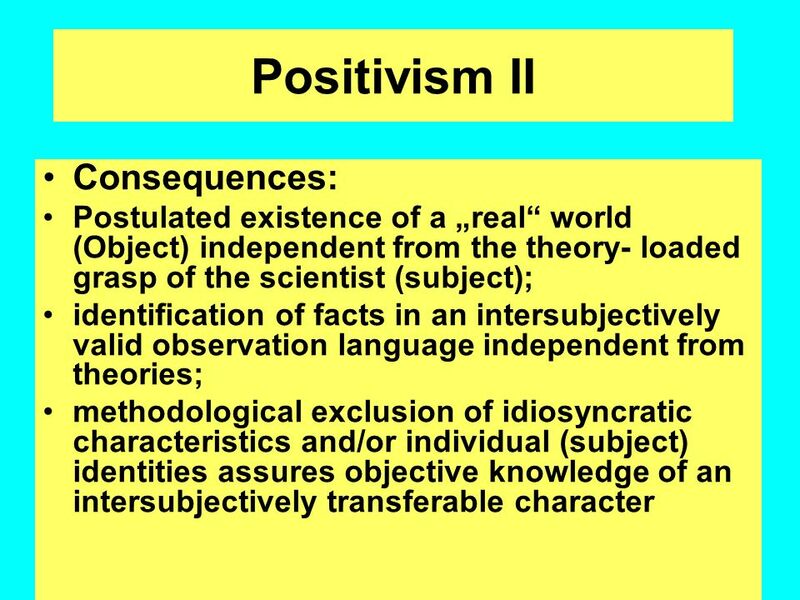 Today the term is used with pejorative intent to dismiss substantive arguments that appeal to scientific authority in contexts where science might not apply. 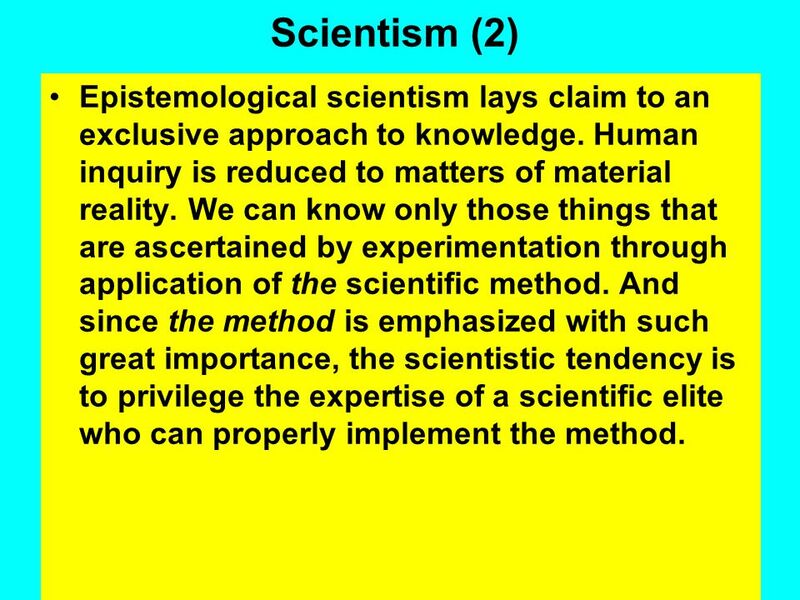 26 Scientism (2) Epistemological scientism lays claim to an exclusive approach to knowledge. Human inquiry is reduced to matters of material reality. 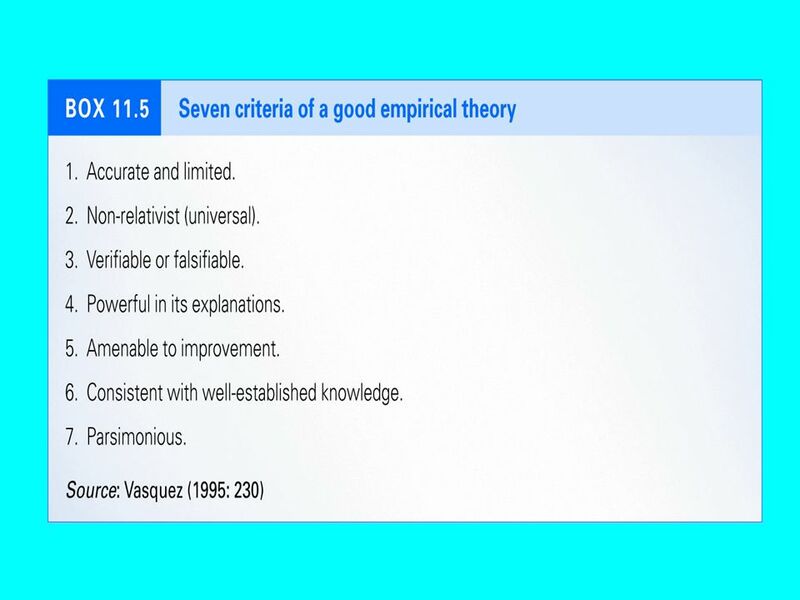 We can know only those things that are ascertained by experimentation through application of the scientific method. 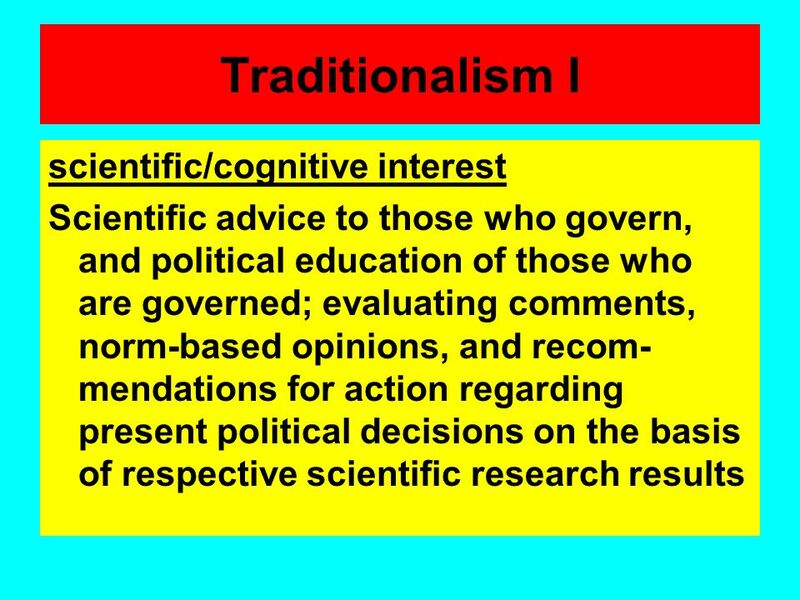 And since the method is emphasized with such great importance, the scientistic tendency is to privilege the expertise of a scientific elite who can properly implement the method. 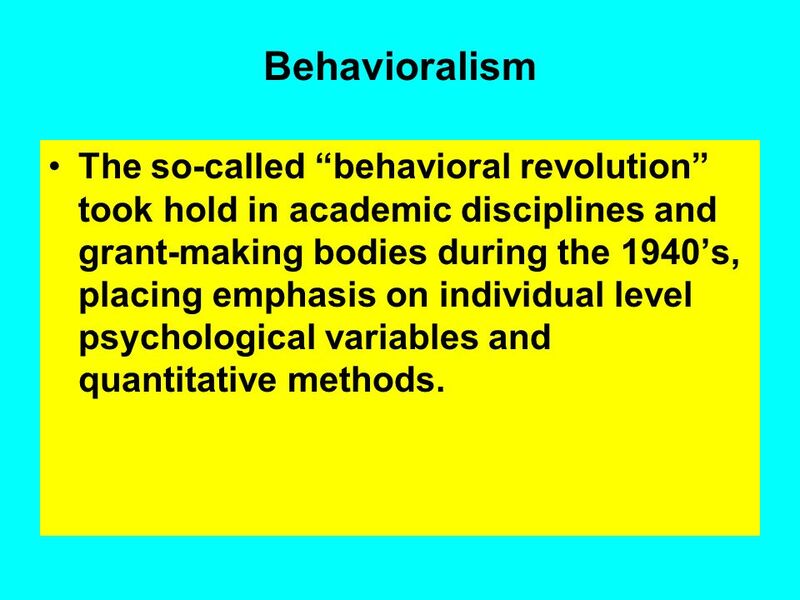 27 Behavioralism The so-called “behavioral revolution” took hold in academic disciplines and grant-making bodies during the 1940’s, placing emphasis on individual level psychological variables and quantitative methods. 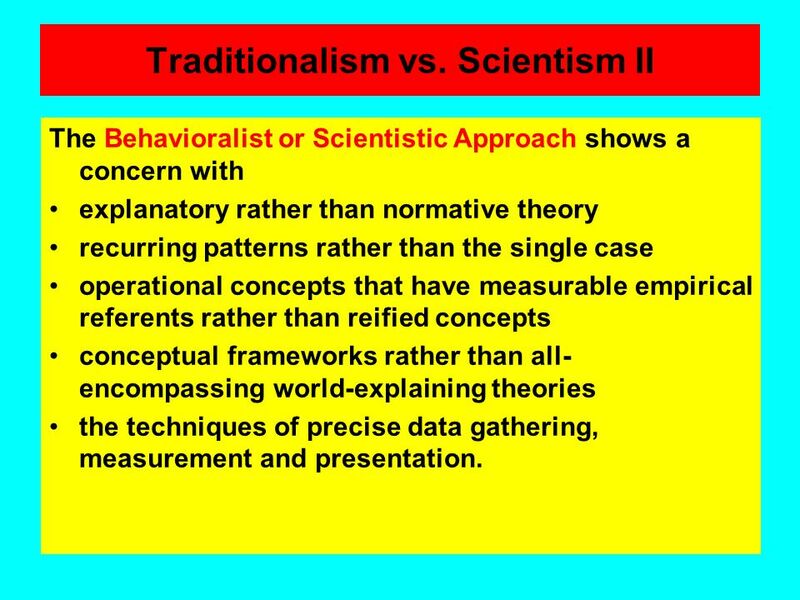 Goal: an interdisciplinary, methodologically rigorous science of human behavior, with the ability to predict as well as prescribe. 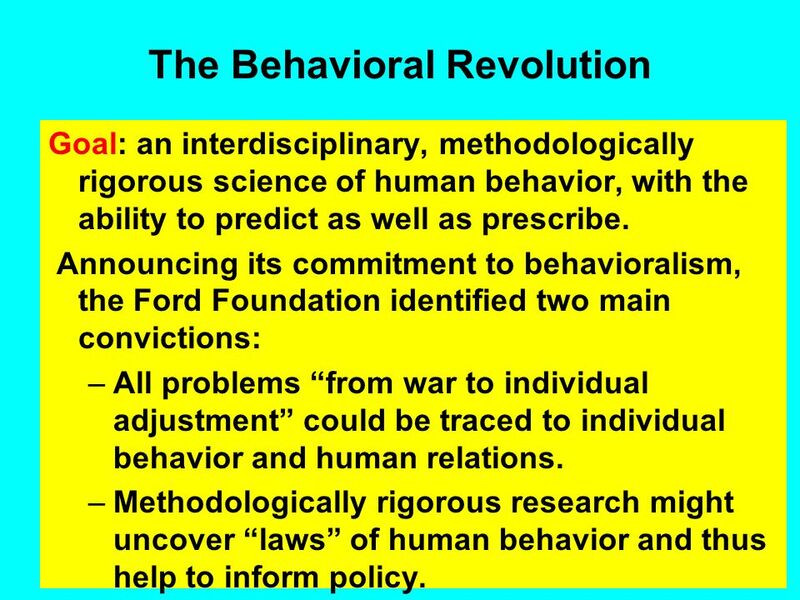 Announcing its commitment to behavioralism, the Ford Foundation identified two main convictions: All problems “from war to individual adjustment” could be traced to individual behavior and human relations. Methodologically rigorous research might uncover “laws” of human behavior and thus help to inform policy. 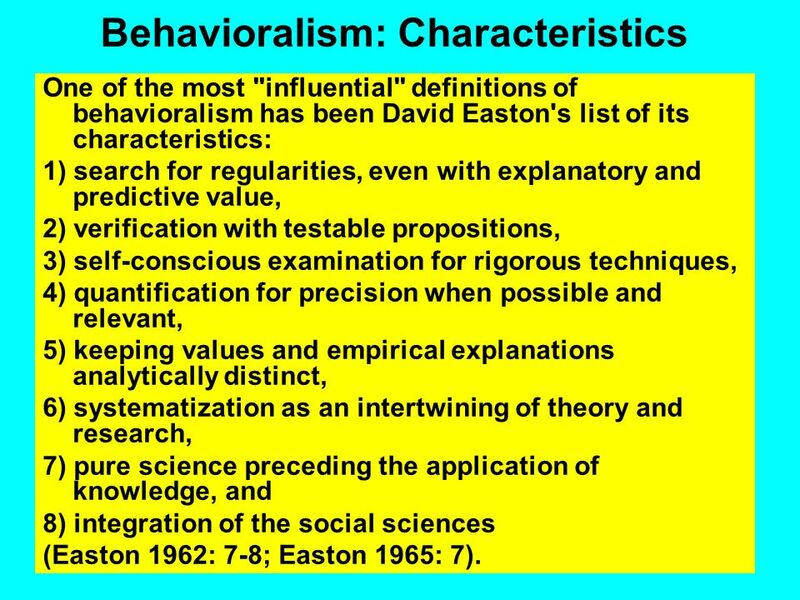 One of the most "influential" definitions of behavioralism has been David Easton's list of its characteristics: 1) search for regularities, even with explanatory and predictive value, 2) verification with testable propositions, 3) self-conscious examination for rigorous techniques, 4) quantification for precision when possible and relevant, 5) keeping values and empirical explanations analytically distinct, 6) systematization as an intertwining of theory and research, 7) pure science preceding the application of knowledge, and 8) integration of the social sciences (Easton 1962: 7-8; Easton 1965: 7). 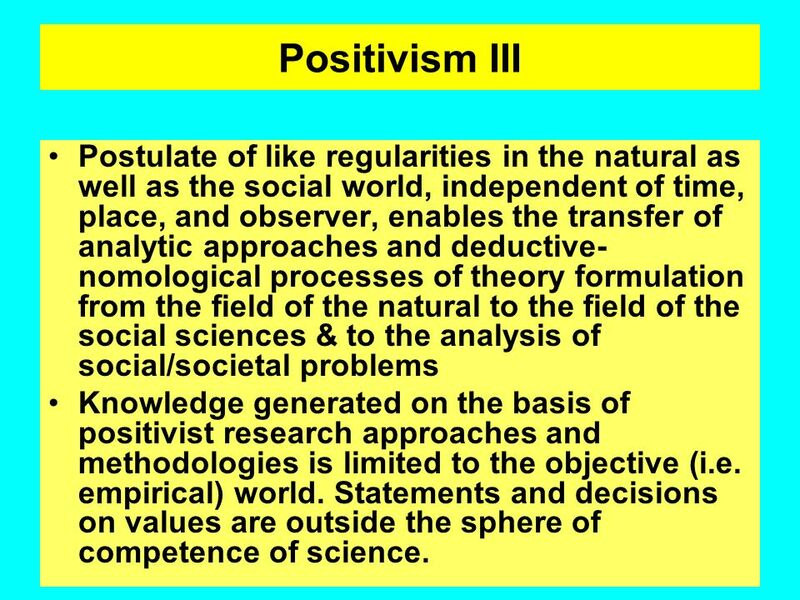 34 Positivism III Postulate of like regularities in the natural as well as the social world, independent of time, place, and observer, enables the transfer of analytic approaches and deductive-nomological processes of theory formulation from the field of the natural to the field of the social sciences & to the analysis of social/societal problems Knowledge generated on the basis of positivist research approaches and methodologies is limited to the objective (i.e. empirical) world. Statements and decisions on values are outside the sphere of competence of science. 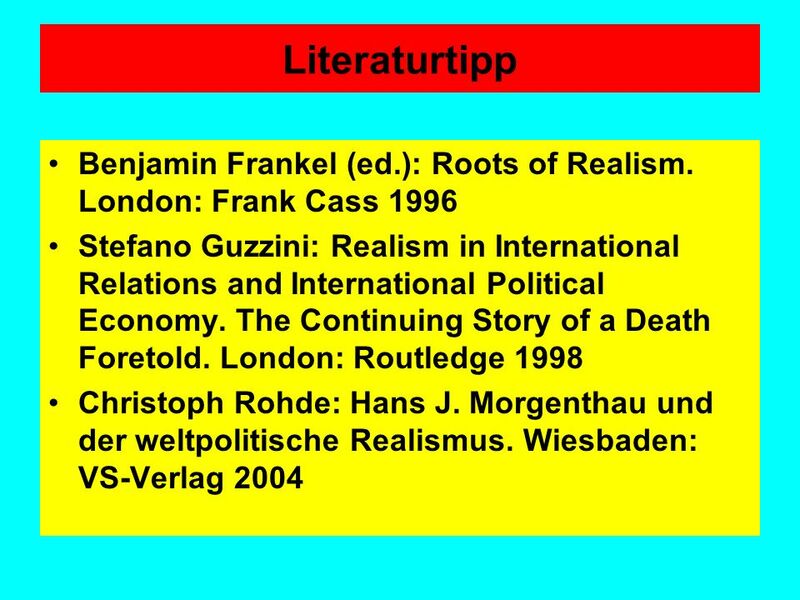 Morgenthau’s work formed the basis for many other authors in the Realist tradition. 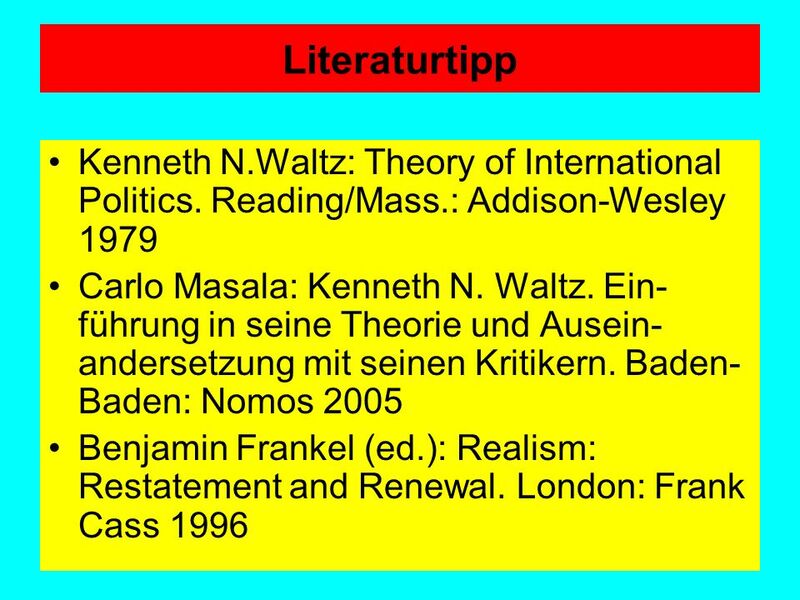 Yet it was not until 1979 that Kenneth N. Waltz attempted to reformulate Realism in a new and distinctive way. 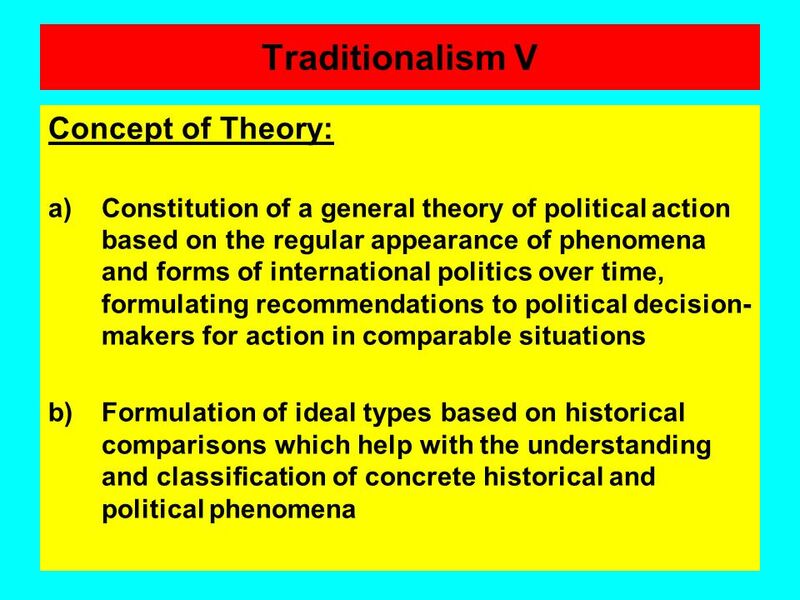 His aim was to cure the defects with earlier theories of international relations, including classical realism, by applying a more scientific approach. 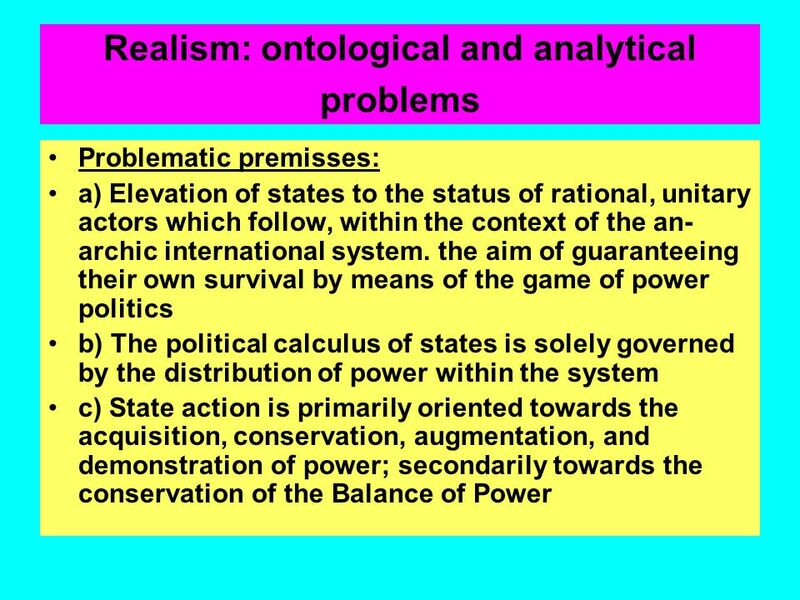 The approach he took in Theory of International Politics became known as Neorealism. 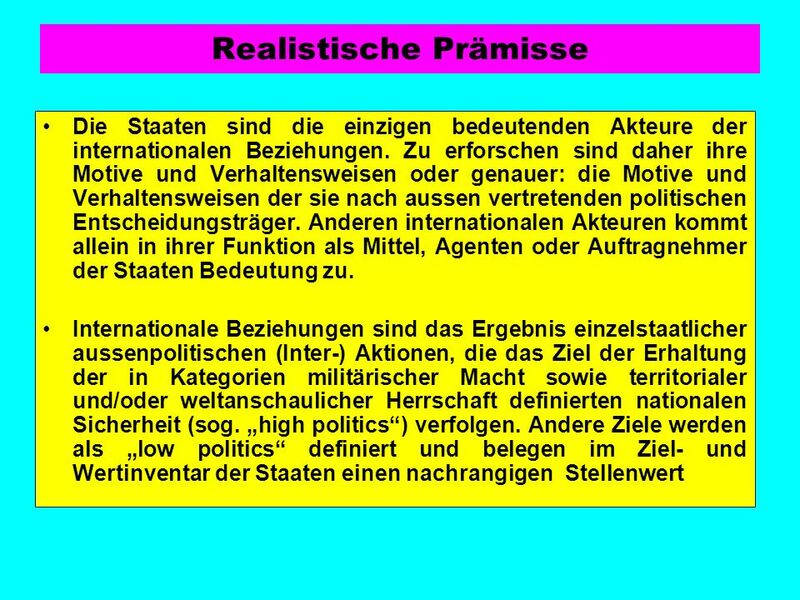 While classical Realists saw international politics in terms of the characteristics of states and their interaction with each other, Waltz believed that there was a level above this. 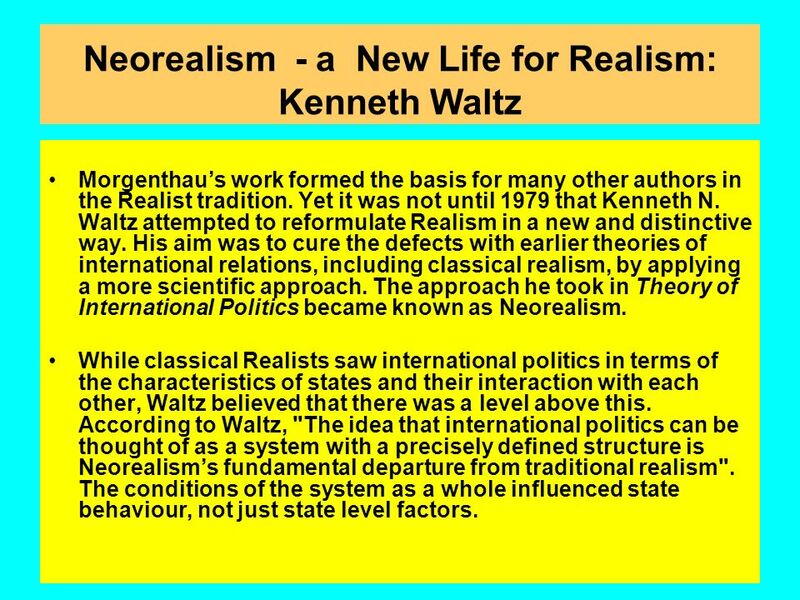 According to Waltz, "The idea that international politics can be thought of as a system with a precisely defined structure is Neorealism’s fundamental departure from traditional realism". The conditions of the system as a whole influenced state behaviour, not just state level factors. 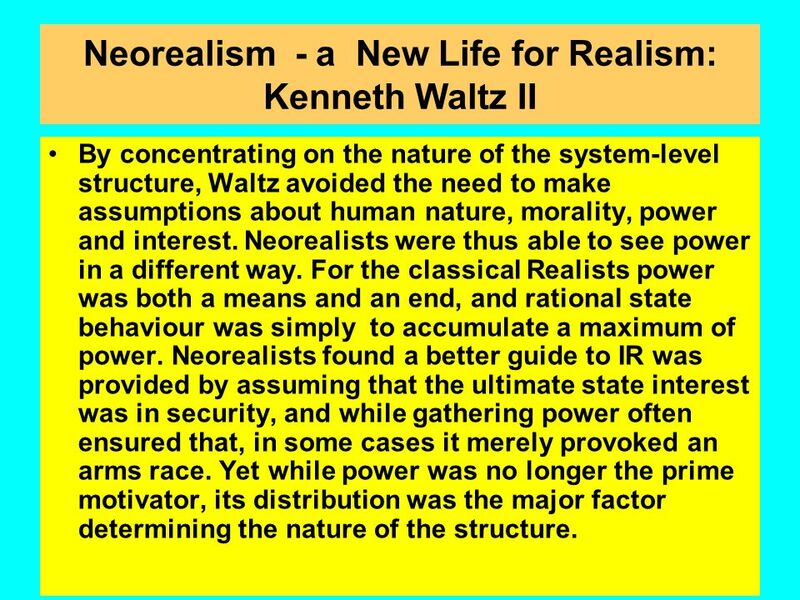 By concentrating on the nature of the system-level structure, Waltz avoided the need to make assumptions about human nature, morality, power and interest. Neorealists were thus able to see power in a different way. 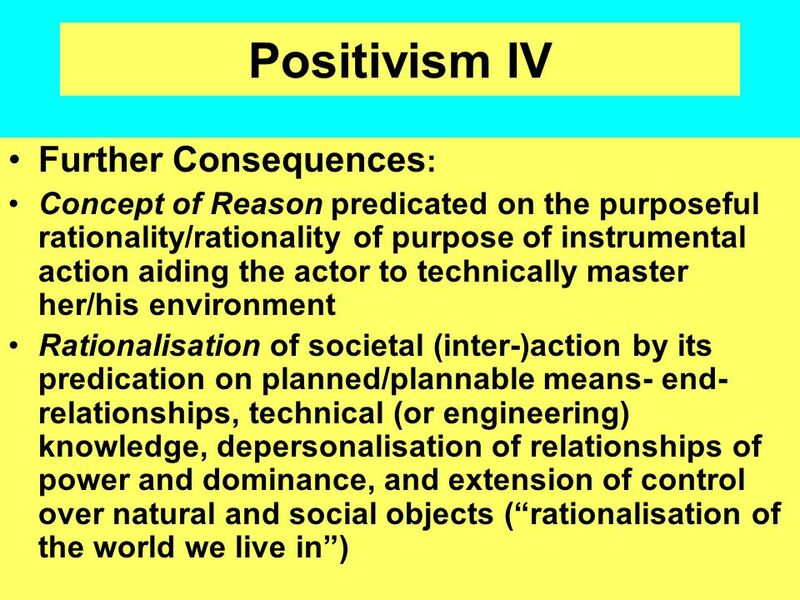 For the classical Realists power was both a means and an end, and rational state behaviour was simply to accumulate a maximum of power. 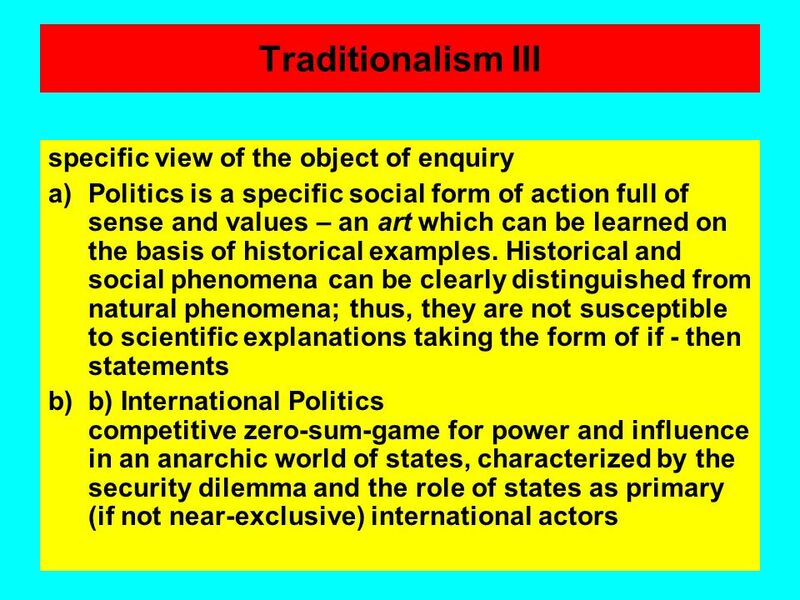 Neorealists found a better guide to IR was provided by assuming that the ultimate state interest was in security, and while gathering power often ensured that, in some cases it merely provoked an arms race. Yet while power was no longer the prime motivator, its distribution was the major factor determining the nature of the structure. 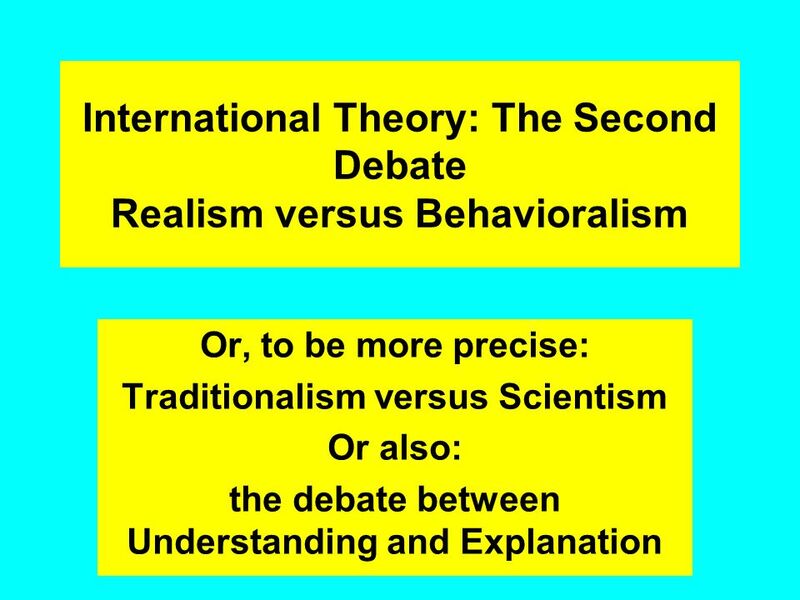 Download ppt "International Theory: The Second Debate Realism versus Behavioralism"
What is Social Theory?. Theory Harrington 2005: 1-3 Greek word theōria, opp. of praxis contemplation / reflection Reflection on the value and meaning. 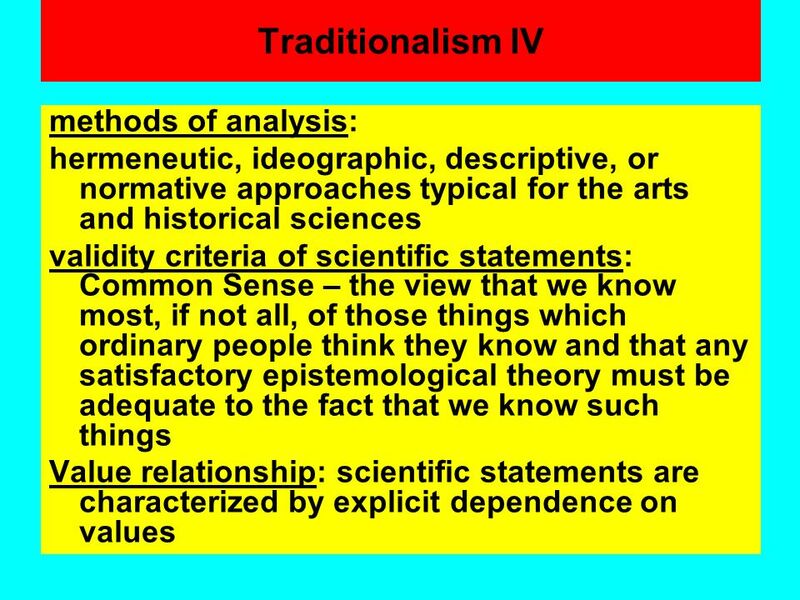 Monday, May 16, 2011 Different Methodologies of IR – A Scientific Epistemology – Case Study: The second Great Debate between Traditionalism and Scientism. 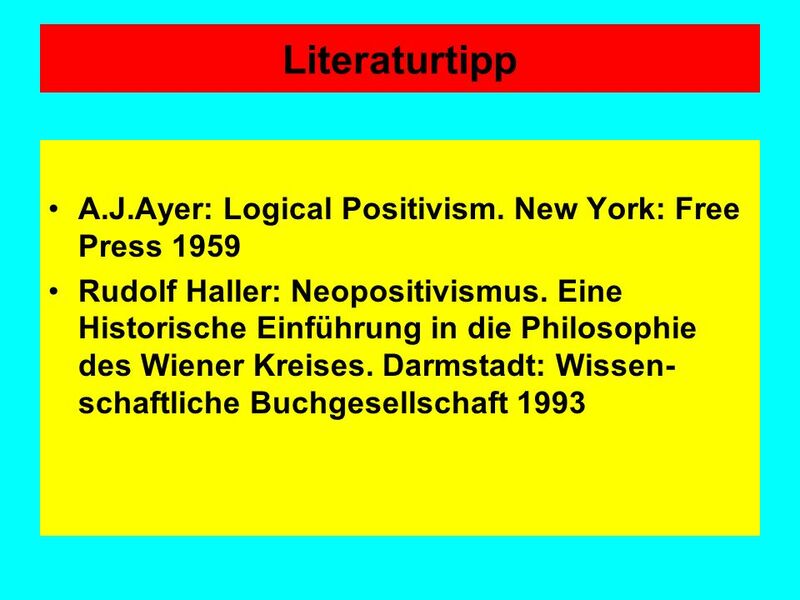 1 From metaphysics to logical positivism The metaphysician tells us that empirical truth-conditions [for metaphysical terms] cannot be specified; if he. 1 제목 서강대학교 교수학습센터 부소장 정유성 Rational Choice theory Nov. 04, 2013 Prof. Dr. Kyu Young LEE. Finishing classical realism. 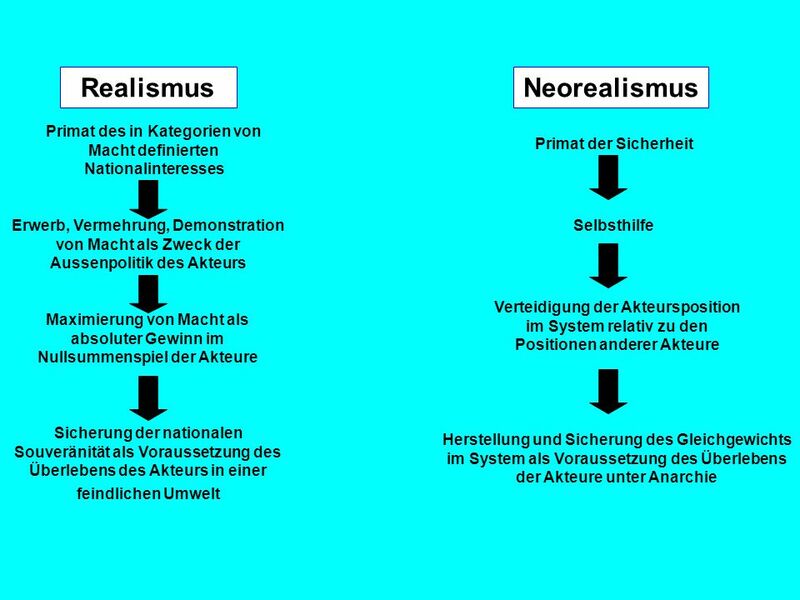 Neorealism. Other contemporary realism. 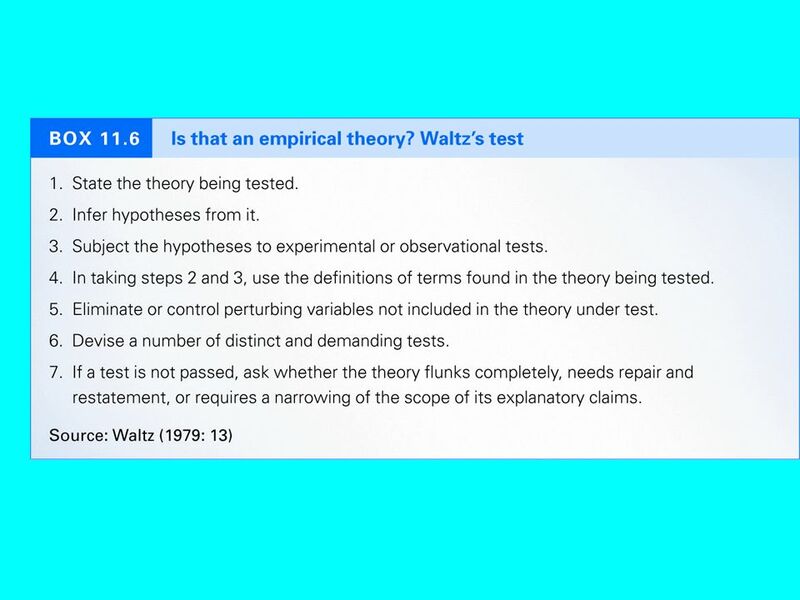 Scientific method - 1 Scientific method is a body of techniques for investigating phenomena and acquiring new knowledge, as well as for correcting and.